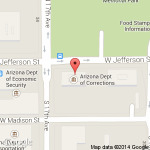 The Board of Executive Clemency usually conducts its business at 1645 W. Jefferson Street in Phoenix, Arizona. Board hearings are open to the public. Hearing notifications are posted on this website and displayed on the main front window of our facility. For the comfort of our visitors not wishing to sit inside the hearing room, our hearings are televised in the general foyer. Individuals who wish to present documents, photographs, letters, etc. to the board for consideration at a hearing should submit these documents to the board office after an inmate's certification of eligibility has been received from the Department of Corrections and forwarded to the Board. Any material sent to the Board prior to an inmate's certification will be returned to the originator. All submissions should be received by the board at least 4 days prior to a scheduled hearing. If you intend to appear at a hearing, please return to this website periodically and check the Hearing Calendar and Posting Sheets for the scheduled date and time of the hearing. Hearing Calendars are updated twice a month and Posting Sheets are updated regularly. Documents may be submitted to the Board at the hearing, prior to the hearing by mail addressed to the Board's administrative offices or by facsimile. It is preferable that all documents, photos, letters, etc. be submitted to the board no later than 4 days prior to a board hearing. It is the policy of the Arizona Board of Executive Clemency (ABOEC) to provide equal employment opportunities, with reasonable accommodations when appropriate, to applicants and qualified employees with disabilities. The ABOEC also provides employees and members of the general public who have disabilities equal access with reasonable accommodations and auxiliary aids, when appropriate, to enable them to have equal access to ABOEC programs, services, hearings and activities.